Mark Lewis knew what it was like to be hot in the majors. He also knew how fast it could cool down, he told The Associated Press in 1995. That June, Lewis went 13 for 16 in a six-game stretch, The AP noted. "When I was first called up to the big leagues, I hit over .400 the first month and a half," Lewis told The AP. "There's no way I can keep this up. I went through this before. I'm not going to get overconfident." Lewis was referencing his rookie campaign with the Indians in 1991. After that hot start, Lewis ended the season with a .264 average. With that hot start in 1991, Lewis also showed the promise that came with his selection three years earlier, taken by Cleveland as the second-overall selection out of Hamilton High School in Ohio. While he never really became the player the Indians had hoped - he played just two full seasons with them - Lewis did go on to see time in 11 big league seasons, his last coming in 2001. The Indians selected Lewis after a high school campaign where Lewis hit .598, with 13 home runs in 27 games. "Since I was 5 years old, I've wanted to play major league baseball," Lewis told The Associated Press after his selection. "This is my chance. I'm not going to mess it up. Cleveland is an up and coming team. I hope to be a big part of it in about three years." Lewis' personal timetable was about right on track. 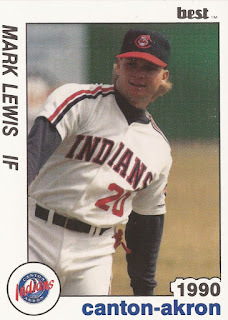 He debuted with the Indians in late-April 1991. He ended up getting into 84 games with the Indians that year, hitting .264 and knocking in 30. Lewis returned for another 122 games in his second campaign, again hitting .264 and knocking in 30. But his time in the next two seasons with the Indians was limited to just 14 games in 1993 and 20 games in 1994. He played the remainder of each season at AAA Charlotte. By December 1994, Lewis was a Red, traded there for Tim Costo. The Reds had plans for him, but those plans were as a backup at third. For the Reds, Lewis got into 81 games, hitting .339. In Game 3 of the NLDS, Lewis hit a pinch-hit grand slam. It was the first pinch-hit grand slam in post-season history. It was also Lewis' first grand slam at any pro level, according to The Associated Press. Lewis moved to the Tigers for 1996, then the Giants for 1997, playing full years in both spots. With the Phillies in 1998, Lewis hit .249 in 142 games. He started his time with the Phillies hitting .188 into late May, before going 3 for 5 with a home run in a May 22 victory at Montreal. "I'm glad we won and I got a couple hits," Lewis told The Philadelphia Inquirer. "Hopefully that will quiet some people down. I wanted that. I needed that." Lewis returned to the Reds for 1999, then played 2000 between Cincinnati and Baltimore. He concluded his career in 2001, with six final games back with the Indians.